With the onset of spring, Washington expected movement of some sort from the British army in Philadelphia. An advance on Washington's Valley Forge encampment was a threat, but because of the American victory at Saratoga and the subsequent French alliance, a withdrawal to New York City was also a possibility, and intelligence indicated that this was the British intention. To protect Valley Forge, determine British intentions, and annoy their foraging expeditions, on May 18, 1778, Washington sent 2,200 men and five guns across the Schuylkill River to the area north of Philadelphia. Commanding the force was Major General Marie Joseph Paul Yves Roch Gibert Du Motier, Marquis de Lafayette, better known simply as Lafayette. The mission was questionable to say the least, the force being too small to have any chance against a major British effort - but more than big enough to lure them into making such an effort. It didn't help matters that Lafayette was just 20 years old, and this was his first command. A fabulously wealthy adventurer, the French volunteer had endeared himself to Washington, who viewed him as the son he never had. Further, with the new French Alliance, giving Lafayette a command was politically expedient. 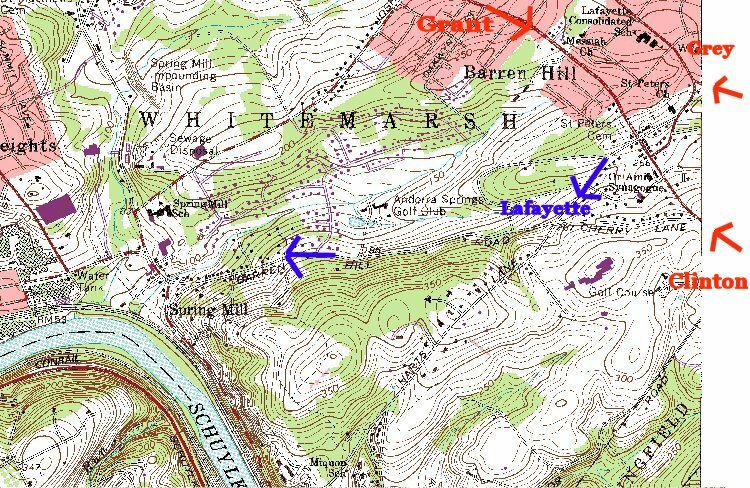 Although ordered to camp in a different location every night, Lafayette believed that his position at Barren Hill was safe. On the night of May 19th, the day after Lafayette left Valley Forge, and also the day after the extravagant British Mischianza celebration which marked the end of Sir William Howe's command, several thousand British soldiers were sent north to surround and bag the quarry. It looked like the Americans had learned nothing from Paoli Massacre and were destined to suffer the same fate again. Clinton and Grant close in on Barren Hill along Ridge Road, while Grey comes in on the Germantown Road. Lafayette escapes down Barren Hill Road to modern Conshohocken. 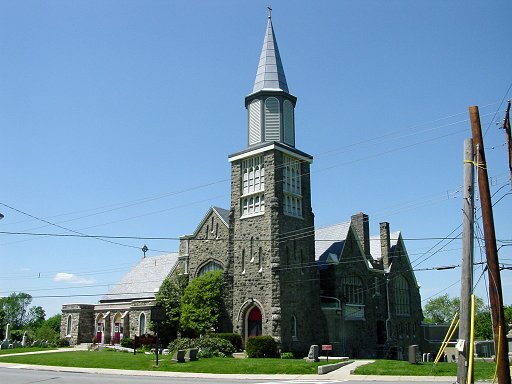 The American line facing toward Philadelphia (to the left of the picture) was parallel to the prominent road, Church Road, in front of St. Peter's Church. Down Church Road to the left, but off the picture, it intersects with the Ridge Road which comes from Philadelphia roughly parallel to the Schuykill River. Generals Clinton and Howe, with what is usually described as a substantial or sizeable force, were advancing directly on Barren Hill on Ridge Road. Down Church Road to the right, it intersects with the Germantown Road, which also comes from Philadelphia, but to the east of the Ridge Road. The American left flank, specifically that of Poor's brigade, rested near the church, and troops used the churchyard wall for protection. As you can see from the modern road on the left of the picture, a gentle slope helped protect their front, but bluffs kept their right safe, so although it was flawed in some ways, wasn't all that bad of a position. "The Indians were amusing themselves and the soldiers by shooting with their bows, in and about the church. I observed something in a corner of the roof which did not appear to belong to the building, and desired an Indian who was standing near me to shoot an arrow at it. He did so and it proved to be a cluster of bats; I should think there were nearly a bushel of them, all hanging upon one another. The house was immediately alive with them, and it was likewise instantly full of Indians and soldiers. The poor bats fared hard; it was sport for all hands. They killed I know not how many, but there was a great slaughter among them. I never saw so many bats before or since, nor indeed in my whole life put all together." On the left are St. Peter's and Church Road. Here, specifically on the right half of the picture, is the aforementioned intersection with the Germantown Road. A column of around 2,000 men under Charles "No Flint" Grey of Paoli fame was advancing on the American left flank by way of the Germantown Road from the right of the picture. Worse even than the threat of Clinton to his front and Grey to his left, Lafayette was threatened in his rear by a column of 5,000 men and 15 guns under Gen. Grant. This British column had moved around the American position to the east and routed a force of 600 militia under Gen. Potter, which was supposed to be protecting Lafayette's flank. Potter failed to send Lafayette word of the danger he now faced. Grant continued north, then west to the stretch of Ridge Road north of Barren Hill, apparently blocking Lafayette's retreat to Matson's Ford and the safety of Valley Forge. Lafayette had not detected the danger he was in, and to the British, the plan was working as well as could be expected. Lafayette was surrounded on three sides, with the Schuylkill River blocking his retreat. It looked like they would succeed in their plans to dine with the young Frenchman that evening, but British officers would have to wait another three years to dine with Lafayette - under much different circumstances at Yorktown. The well dressed forces of corrupt un-constitutional monarchy would NOT prevail this time!